Ringo Starr is making appearances in New York’s Strand and Toronto’s Indigo bookstores, and we are offering you the opportunity to meet him at these events. You’re invited to help Ringo celebrate the North American release of his fine art prints: The PHOTOGRAPH Portfolio 2015. The ‘Access All Areas’ pass includes a print of your choice, which will be signed, framed, and shipped to your door. You will have your picture taken with Ringo himself to commemorate the occasion. To view more information on these events and purchase your exclusive pass today, click here. To browse the prints and make your selection, click here. 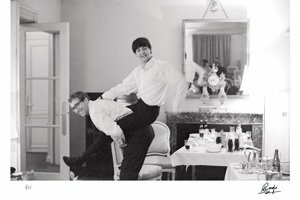 Above: This fun picture of Paul McCartney and Mal Evans is just one of ten prints available in The PHOTOGRAPH Portfolio 2015.